I have to admit, even after my great swatch experiment, I was Nervous! Knitting this cardi didn’t take longer and it wasn’t any more difficult than anything I’ve made before but just the thought of all those hours going Down the Drain, so to speak, if it went south at the very end, made me drag my feet. But this week was not the week to be weak, and into the hot, hot sudsy water she bravely went (with two thick towels for moral support)! I patted it out flat on a table and measured and VOILA! It came out as Planned! Talk about happy dancing like nobody’s watching – well – you had to see it to believe it! Most satisfying of all? My original dream that this design would work well with the indigo yarn came true! All the areas and details performed in a most lovely way: the lace patterning had lovely “polished-to-white” highlights and the reverse Stockinette stitch made a soft textured field of slightly variegated color. All in all a most happy knit! And how do we celebrate the HAPPY here at Studio Chic? How about a Giveaway! 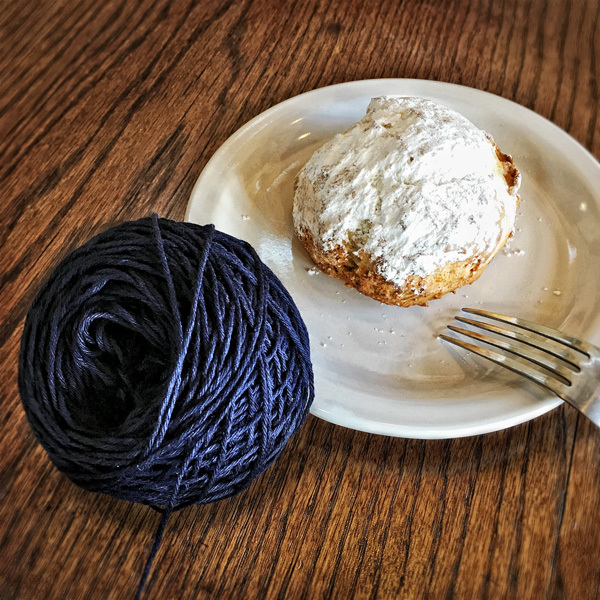 I have more of this lovely yarn and am going to cast on another (Gansey-inspired, shhh…) cardi very soon and would love to share a cone with YOU! I’ve always been drawn to those knitting techniques that are dangerous. You know the ones – the ones where you cut the fabric to divide it (Steeking) or treat wool in the way opposite of normal to get a thicker, firmer fabric (like Felting). Working with this denim yarn was right down that dangerous alley and I am game! 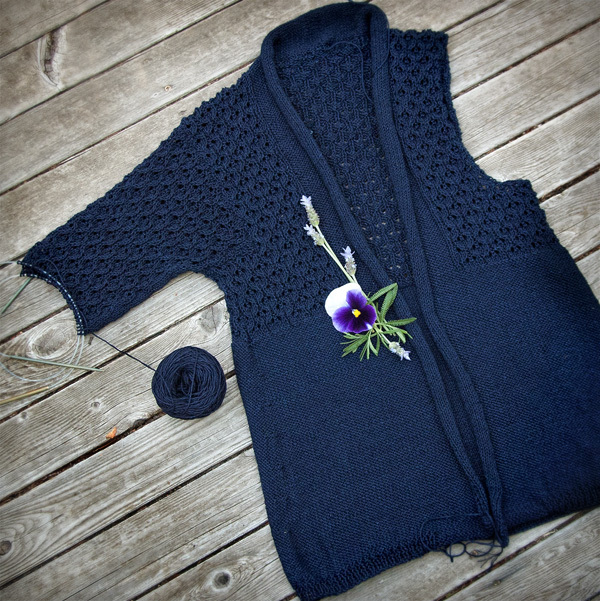 At this point, I’m 1/3 done with the second sleeve of my indigo Cerisara Den-M-Nit cardi. It is looking long and lanky and a little flopsie and untidy. Even though I switched to bamboo needles early on, its fabric just doesn’t have the integrity and cohesive feel you normally would find on something you’re working the correct gauge on. But just as I was starting to lose faith (which at this point in the project is rather ridiculous because I know I just won’t walk away), I remembered something. I had a big swatch I could torture and if successful, go forth to the finish line and “knit on, with confidence and hope, etc…” YAY! Now it was just begging for those final denim yarn game steps to prove to myself I could do it, I could master this Indigo Challenge! So I processed it just like I planned on shrinking the cardi itself. I washed it in my top-loading machine with some old towels and dried it in the dryer. And what to my wondrous eyes should appear? Now, instead of a wiggly, slightly sloppy feeling piece, it had morphed into a firm and symmetric and LOVELY testament that the someone who invented this wonderful stuff Indeed Knew What They were Talking About! Most fascintating and joyful of all? This was the thing I was most skeptical about – I just didn’t believe it was going to look like the promotional shots in all the marketing. 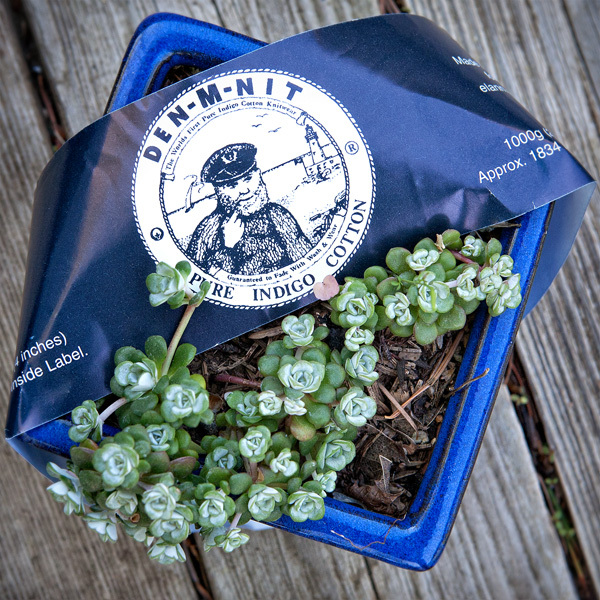 But indeed – it is softer (still dark) and variegated and full of beautiful depth. Now I’m ready to finish that Last Sleeve with a bang! Like many of the knitters I know, I have a dedicated bag that goes with me almost anytime I leave the house. I LOVE to knit in public. Newest addition to it? Besides the current indigo WIP, along comes that apron I wrote about in the last post so my clothes stay neat and blue-free. I’ve been taking it all everywhere and getting lots done. But why is the Captain sporting that little Mona Lisa grin? Methinks he agrees that knitting with indigo yarn is FUN but maybe also that knitting in public at a place with dangerous treats is just redonkulous (even with an apron!). This is me not being able to resist a fabulous treat at the counter then faced with the messy reality at the table. But, OH, the sacrifices one must make for their knitting! My Cerisara WIP is finally starting to look like a cardi! After another seven inches of body knitting, I cast off and am now onto the first sleeve. Before I could get going with the sleeve knitting, I realized there was going to be a challenging step I had not considered when I started this sweater. 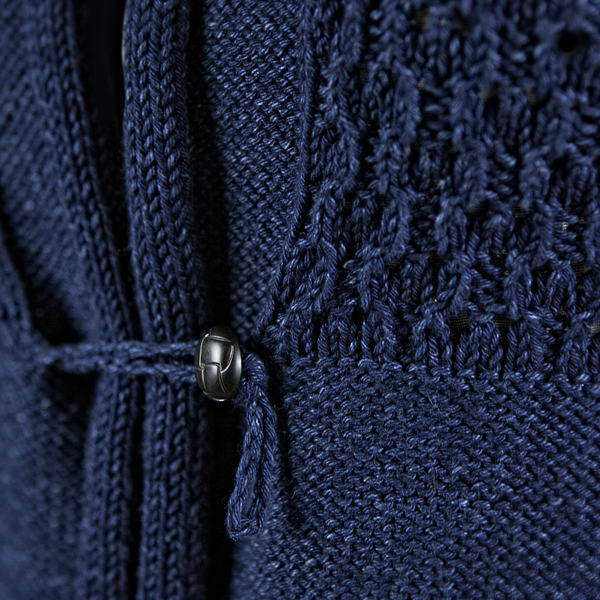 The Cerisara pattern is part of what I call Chic Knits’ the Sweater Organic™ series. 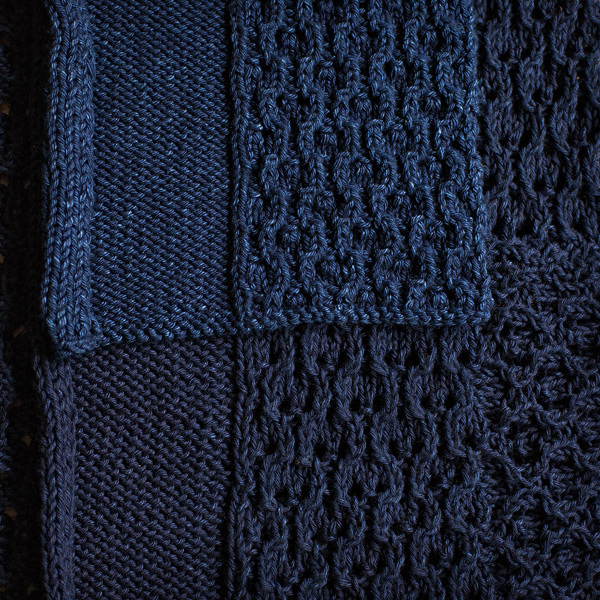 These sweaters all have something in common: they are seamlessly grown while knitting. All begin with an initial piece, then progressive sections are added by picking up stitches on the original section. 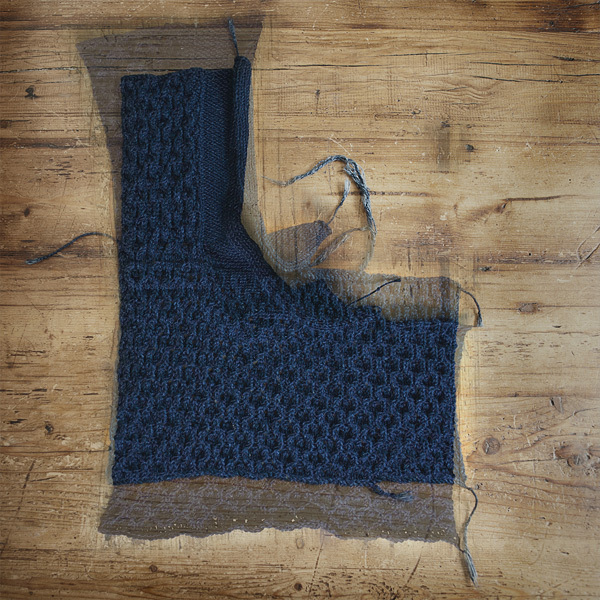 For my indigo Cerisara, the next section added, after the Body is finished, is a sleeve and it is started by picking up stitches around the armhole, then working down to the cuff, in-the-round. However, if you recall, in compensating for the shrinkage factor of the denim yarn, I added extra length to the armhole, which now throws off the pick up ratio given by the pattern (3 sts picked up for every 4 rows worked). How to adjust? Not too hard actually – the same principles of the initial calculation when I wrote the pattern would work here as well. 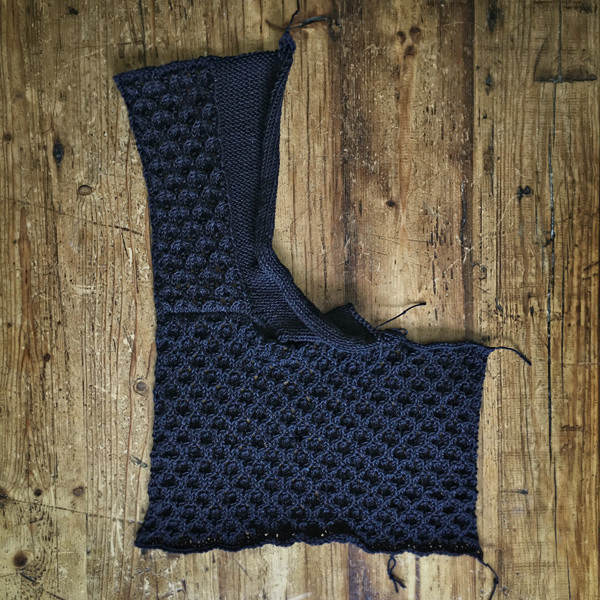 In this case, on the first side, the armhole measured in rows to shoulder = 64 rows. (You can visually round out the above numbers to 4/6 pretty quickly which gives the same result). Now, since this doesn’t produce the exact number of stitches the pattern calls for, some adjustment would probably (and was) necessary on the first row worked after the pick-up row. 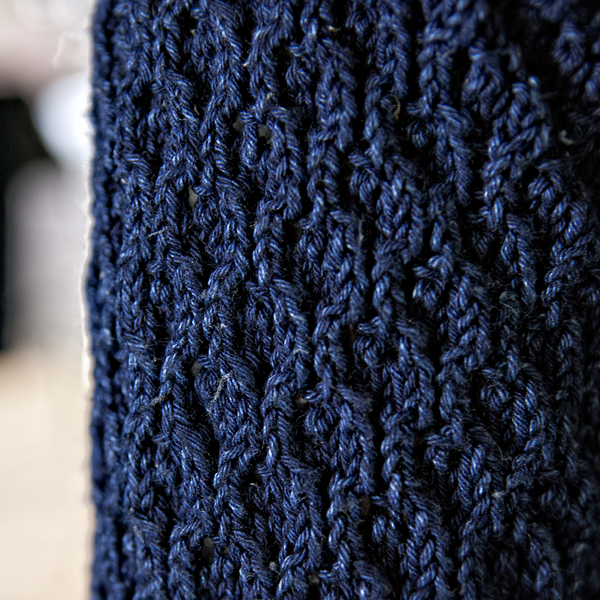 But this was simple – in most of my Sweater Organic patterns, the first row worked is a purl row (or mostly purls) and it’s easy to p2tog (or add a stitch) as needed to achieve the needed overall beginning count. Now that I had the proper stitch count, I could get going on those sleeves. But wait just a minute please. What about all that Sleeve Shaping in the near future?~!